A one and a half hour drive from Portland and 15 minutes from the state capitol of Augusta. The “Loon’s Nest” is a three-bedroom, year-round home nestled on a gradual sloping lawn to the water’s edge. In addition to the three bedrooms, the first floor features a full kitchen, living room with basic cable TV and open dining area with a cathedral ceiling where you can enjoy your morning coffee and watch the sun rise over the lake or sip an evening glass of wine and look at the moon over 'Big Island'. Bathed in sunlight on the second floor are another bedroom and a reading nook, complete with dozens of books and a single bed that overlook the water. The bathroom features a large tub and separate shower. The first floor laundry room has a washer and dryer and a second single bed, which is ideal for one of the kids. The 100 feet of deep-water shore frontage features a dock for fishing, swimming, diving, sunning or listening to the loons. Two kayaks, a paddleboat, an aluminum row boat and an old fashioned inner tube also await you at water’s edge. You are also welcome to bring your own canoe or powerboat. At night, start a camp fire in the lakeside fire pit , roast marshmallows and watch the glow of the fire as you reflect on the day and plan the next. Annabessacook Lake features a boat-launching ramp 1/4 mile from the “Loon’s Nest” and the quiet lake is full of bass, pickerel and pike for the adults, and plenty of perch and sunfish for the kids. Several pairs of loons live on the lake and their beautifully haunting call can be heard day and night. In addition, a couple of eagles also reside on the lake and wild turkeys live in the nearby woods and occasionally visit. The “Loon’s Nest” is 3 miles from downtown Winthrop, with small-town shopping, a few restaurants, a laundromat and a large grocery store; 4 miles from the town center of Monmouth with its renowned summer theater; five miles from the nearest golf course; 15 miles from the state capitol of Augusta with its shopping, cinemas, restaurants , and only an hour away from LL Bean and the outlets of Freeport. I've spent every summer on Annabessacook Lake since 1988 at another camp a mile away from the 'Loon's Nest'. The Loon's Nest and the Lake are special places and is being rented for its 12th summer in 2019--- the many positive reviews speak for themselves. Large first floor bathroom with large tub and a separate shower. Bathroom has plenty of towels, a hair dryer & soap. 100 feet of deep water lake frontage with a dock to swim from. There is no beach area, but there is a ladder on the dock to ease yourself into the lake, or you can jump in. Oil furnace and propane heater to take the evening chill off . PLUS a lakeside fire pit. WI-FI throughout the house. There is also excellent cell phone reception for most phones . My family and I just got back from our second stay at the Loon's Nest. It was everything that we remembered from our first trip and more because this time, we were able to enjoy the lake and the boats in addition to being able to spend time visiting friends and family. This house is just perfect for our three generational getaways to Maine . My son-in-law is a chef and just loved the kitchen. The kids loved the lake and the kayaks and the paddle boat and row boat. My daughter and I love that we each have a bedroom that we love. Mine is the one with the wood panel which also happens to get the best cross ventilation breeze in the house. Hers is the one with the lake view and queen size bed! The teenagers love the loft and the upstairs bedroom too. We alternated between spending time at the lake and getting out to enjoy some of the other highlights of the area. We left hot and humid Northern Virginia for a glorious week in Maine with cooler temperatures and wonderful lake breezes. We have already started talking about our next visit. One week was not enough! We hope that next summer we can spend two weeks at the Loon's Nest with our whole family so that we can do everything that we loved this year plus some of the things that we didn't get to do this time. It is a pleasure to deal with the owner of this beautiful property. After two successful bookings, he feels like a friend. He is very responsive which I really appreciate and know isn't always the case from other rental experiences. 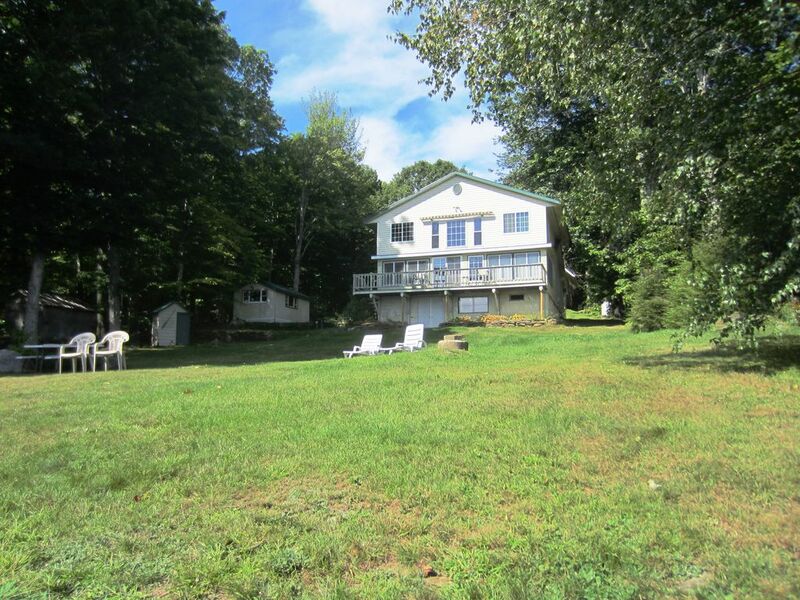 Given that we are trying to schedule a third and maybe even a fourth visit, it goes without saying that we would recommend this property and this owner to anyone wanting to spend a week on a beautiful lake in Maine! Our best family vacation yet. We enjoyed an August/Sept week with our family of four, including 2 tween daughters, as well as a Grandfather and Uncle along with us. Even with 6 of us, the house was never crowded. We spent almost everyday kayaking, swimming in the lake, and playing in the yard. We also rented a pontoon boat from Collins Boat Rental for a few days to explore the lake and go tubing. The lake was so peaceful. We all really enjoyed the beautiful sunrises and the call of the loons. We even got to see the bald eagles soar by after roosting on the islands. This beautiful home exceeded our expectations and had everything you could ever want. By far the best property on the lake! The Loon's Nest provided our two families with a wonderful place to kick back, relax and unwind for our summer vacation. The house was spacious and beautiful. The kitchen was easy to work in, a/c helped on the hot days, the grill was brand new, washer and dryer were so good to have, and we had all the firewood we needed for evening campfires. The view of Lake Anabessacook was spectacular. We fished, kayaked, swam, and explored the lake. The loons' call was beautiful...a peaceful and ghostly sound. We enjoyed seeing the loons and all the nature around the house. I definitely recommend this property for rental. You won't be disappointed! This is the second time we've stayed at the Loon's Nest and it was even better than we remembered. The location can't be beat - Lake Annabessacook is large enough to offer lots of recreational opportunity, but small enough to feel very private. Steve has outfitted the property with kayaks, a rowboat, big innertubes, a paddleboat and plenty of life vests for all sizes - we emailed to let him know that a gasket was missing from the paddleboat and he brought a new one over two days later! The back yard is perfect for get-togethers, the dock is clean and comfortable and the water was gorgeous with a couple of loon families who swam right along with us and sang to us at night. We brought stand up paddle boards with us and had a blast. The house has plenty of room with a light and airy layout and fantastic views of the lake, very clean, well-stocked kitchen, gas grill, plenty of towels. Great location, 5 minutes from the grocery store, within an hour's drive of Freeport, several coastal beaches and plenty of other Maine beauty. Definitely recommend and will plan to stay again. We've stayed at the loons nest 4 or 5 times now and it is always a lovely time for kids and adults. We loved listening to the loons call all over the lake and playing on and off the dock. Lots of fun water toys and a great yard for picnicking and running around. Lots of fun activities around, however once I'm at the loons nest I'm hard pressed to think of a place I'd rather be. Kids honed their swimming skills and it was peaceful and beautiful. So glad to have had the opportunity to stay in this sweet home! We just got home from a delightful week at Loon's Nest. The house is very roomy and comfortable and does not have the feel of a "typical" rental property -- instead it felt like we had been invited to stay in someone's home for a week. The lake is gorgeous and we made great use of the kayaks. We caught a bunch of largemouth bass and perch as well as a few smallmouth bass. The eagles, osprey and loons were always around to provide entertainment. There are also a bunch of really nice trails nearby if you are inclined to so some hiking. All in all, it was a wonderful stay and we wouldn't hesitate to do it again.